Incident Details: A lady walking with her partner slipped and broke her ankle . 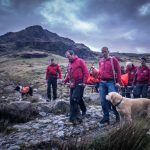 The Team set off to Stonethwaite with two vehicles full of personnel, and a local Team member went direct to the scene. The casualty was treated at the scene, and then carried 100 metres to the Team Landrover, which then drove her to the road head. She was taken to the Cumberland Infirmary by her companion in their own car. 14 Team members – 1 hour 27 minutes.